When travelers think of Mayan ruins in Guatemala, they almost always think of the Tikal ruins. However, there are numerous other Guatemala Mayan sites, ranging from the small and well-preserved to the remote and utterly massive. The following are the most celebrated and easy-to-access Mayan ruins in Guatemala. The Tikal ruins are undoubtedly the most famous Mayan archaeological site, not just in Guatemala, but possibly also in the entire Maya Empire. 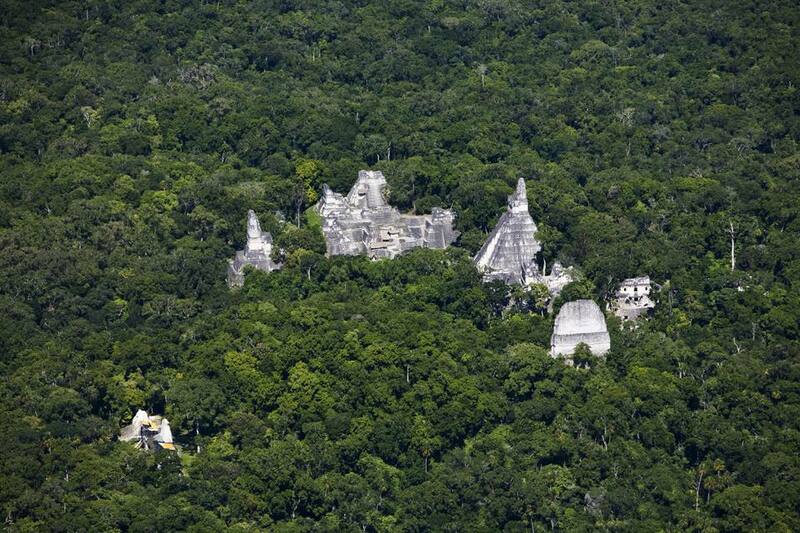 Designated a UNESCO World Heritage Site in 1979, Tikal was once among the most powerful ancient Mayan kingdoms. Today, the Tikal ruins easily accessible for travelers, located near abundant accommodations in the colonial town of Flores. However, it's even better to stay in Tikal National Park itself, wake before dawn, hike to the top of Temple IV, and greet the sunrise over the El Petén forest. Remote, colossal El Mirador contains the greatest concentration of pre-Classic Mayan ruins in the world, though many of its 2000-year-old buildings are still hidden by dense vegetation. In fact, El Mirador is three times the size of Tikal. However, while Tikal receives more than 200,000 visitors per year, only a few thousand conquer the trek into the heart of the El Mirador ruins. Its attractions are more than worth it, though, including the La Danta pyramid, the highest structure in the Mayan world at 230 feet. In 2005, the Guatemala Mayan ruins of Yaxha served as the backdrop for the American TV series “Survivor: Guatemala: The Mayan Empire”. Yaxha has attracted more and more visitors ever since, though nothing compared to the nearby Tikal ruins. The lakeside Mayan archaeological site is home to more than 500 structures, though most are still covered by forest. Zaculeu means "white earth" in ancient Mayan, and is known as the white city of the Mayans, due to the stone used to construct Zaculeu's temples and structures. The site has been restored by covering the bricks in white plaster, giving the site a unique appearance. Also known as Siaan K’aan ("born in heaven") and Waxactún, Uaxactun is one of the oldest cities in the Mayan Empire, with some structures dating all the way back to 330 BC. The artwork discovered at Uaxactun is truly incredible, and it's the primary site where the ancient Mayans used astronomy to develop their calendar. Quiriguá is home to some of the most fantastic stelas, or tall stone carvings, in the ancient Maya Empire. The most celebrated structure is Stela D, which depicts the Quiriguá "King of Kings" K’ak Tilw Chan who defeated Quiriguá's rival city, Copan. The tallest stela in Quiriguá is 35 feet tall and weighs more than 65 tons. Though the Mayan ruins of Aguateca are among the best preserved in Guatemala, the site still doesn't draw many visitors compared to other Guatemala Mayan ruins. The journey there is part of the attraction: travelers must take a boat across the lake to the site, stopping to wade if water levels are too low.